The seven-seat Audi Q7 SUV benefits from a ‘win-win’ upgrade this week courtesy of a new version of its 3.0-litre V6 TDI engine which brings lower emissions, higher power and torque and improved performance and fuel economy. The even more efficient 2008 Model Year Q7 3.0 TDI quattro, which is also now equipped with an exhaust-cleansing Diesel Particulate Filter (DPF), is available for order in standard, SE and S line trim priced from £38,075 OTR. It forms part of a Q7 development programme which also includes petrol/electric hybrid versions that slash fuel consumption and emissions by over 20 per cent. Featuring an advanced common rail direct fuel injection system using sophisticated piezoelectric quartz crystal technology, the upgraded V6 TDI engine benefits from enhancements that boost combined cycle fuel economy in the Q7 3.0 TDI quattro from 33.6mpg to 34.9mpg, reduce CO2 output from 279g/km to 260g/km and bring down the 0-62mph time by 0.6 seconds to 8.5 seconds. Power rises from 233PS to 240PS, delivered at 4,000rpm, and torque increases from 500Nm to an even healthier 550Nm, available from just 1,750rpm. Diesel is of course far from the only source of responsibly delivered power to be championed by the Vorsprung durch Technik brand. As well as exploring the possibilities opened up by second generation ‘future fuels’ such as the biomass-to-liquid (BTL) SunFuel, Audi is also testing fully operational prototypes running on bioethanol (E85), CNG (compressed natural gas) and petrol/electric hybrid power. Q7 hybrid reduces consumption and emissions by over 20 per cent. 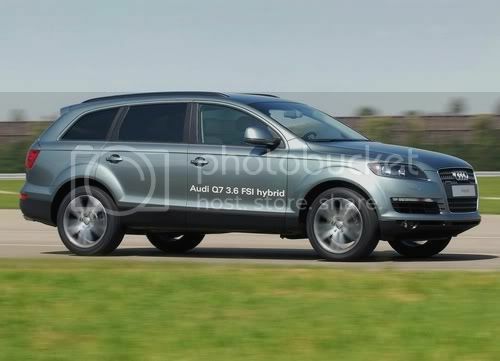 The Q7 hybrid is expected to go on sale in its first markets towards the end of 2008, combining its familiar 280PS 3.6-litre FSI petrol engine with an electric motor situated in the drivetrain powered by a 288-volt nickel metal hydride (NiMH) battery, which adds a further 51PS. The Q7 hybrid reduces fuel consumption, and therefore C02 output, by approximately 23 per cent compared with the Q7 3.6 FSI as we know it today. Designed in a parallel configuration in which all major assemblies are arranged in line, helping to reduce weight and energy loss, the 3.6-litre FSI V6 with its 375 Nm torque peak is boosted by up to 285Nm by the electric motor. Channelled via a six-speed tiptronic gearbox and through the quattro four-wheel-drive system with asymmetric 40% front / 60% rear torque split, this joint output enables a 0-62mph acceleration time of just 7.6 seconds (standard Q7 3.6 FSI 8.5 seconds) and combined fuel consumption of 28.8mpg (standard Q7 3.6 FSI 22.2mpg). The Q7 3.6 FSI’s 309g/km output is reduced to 237g/km thanks to the electric motor and a number of revisions to ancillaries such as the power steering pump. Fundamentally, three driving modes are possible. The FSI engine and the electric motor can each work on their own as the drive unit, or the vehicle can combine the power of the two for acceleration. In this mode, the petrol engine is responsible for basic operation, whereby it also needs to supply energy to the battery. Recuperation conserves energyThe electric motor on the other hand can operate independently and almost inaudibly at speeds of up to 30mph, considerably reducing exhaust and noise emissions in built up areas. It is also able to feed kinetic energy back into the system and so recharge the battery when the vehicle is braked or coasting. During this operation, known as recuperation, the motor reverses its function to become an alternator. The capacity of the NiMH battery allows the vehicle to be driven up to 1.2 miles on purely electrical power – coasting and braking feed additional energy into the system. When the capacity limit of the battery has been reached, the combustion engine is activated to recharge the battery. Through regeneration measures such as these, the Audi Q7 hybrid recuperates about 720 kWh of energy a year – approximately a sixth of what a four-person household uses – based on an average of 12,000 miles per annum. If the Audi Q7 hybrid is coasting without the accelerator pedal being depressed, the combustion engine is switched off – this is possible at speeds up to 74mph. It is also switched off if the vehicle remains stationary for more than three seconds. To continue the journey, all the driver has to do is to remove his foot from the brake and to depress the accelerator pedal again. Like the standard Q7, the hybrid also has space for three rows of seats and a large luggage compartment. The battery system that supplies energy to the electric motor is located in the spare wheel recess at the rear of the vehicle. Compared to earlier generations of hybrid vehicles, the electric motor and the battery are extremely lightweight. The battery weighs 69 kg and the hybrid module with the electric motor 40 kg.